View More In Shifters & Parts. O-Ring: made of silicone, to protect the bike frame and inside cable. Note: Adopting double ends bike spools, Keep the required brake tip and cut off the unwanted end, more convenient. Made of PVC material, low temperature & intense heat resistant. Durable, and this shift and brake cable set will add better performance for your bicycle. 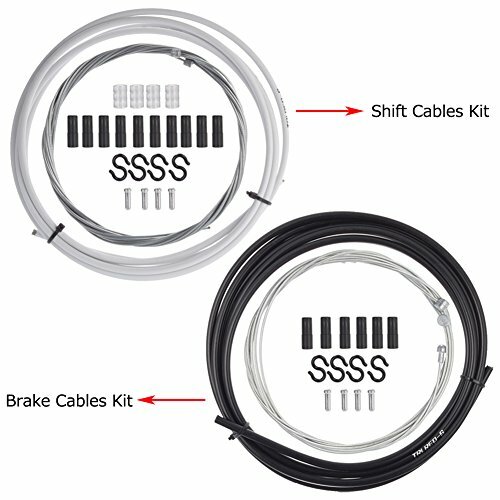 High quality shifting cable kit, Comes with 2000mm 4mm Shift Cables + 1550mm Front shift cable(with cable ends) + 2100mm Back Inside shift cable(with cable ends) + 10pc Cable ferrules + 4pc Spool S buckles + 4pc O-Rings + 4pcs Inside Cable Tail Caps. Handy Brake cable kits, 2500mm 5mm Brake Cable + 1100mm Front brake cable(with cable ends) + 1700mm Back side brake cable + 6pc cable cover + 4pc Spool hook + 4pc cable tail caps included. Usage: Mountain bike(MTB), BMX, Road bikes, Kids' Bikes, Folding bikes, DIY Cable pipe installation and etc. PTEE tube inside, durable to use. All bicycle cable parts are packed in Poly Bag, to ensure your received item is in a good condition. If you have any questions about this product by PChero, contact us by completing and submitting the form below. If you are looking for a specif part number, please include it with your message.